Welcome, and thank you for picking PayGo as your point-of-sale solution! Your software can do many mighty things, but we’ll get you started with the basics so you can get your software up and running in no time. Note: In your Admin Central screen, you can click the QuickStart button on the left side of your screen. This will open up a quick-start wizard that will help get you started on your new PayGo software. For more information on your central screens, see PayGo’s Central Screens. On your first login, your login screen will prompt for your username and password. You can define your own logins and passwords later by clicking the Employees button on your Menu Screen and setting them up within employee profiles. For more information on security and access settings for your employees, see Changing Company Security and Access Settings. The easiest way to start working with your PayGo software is to use the quick start setup wizard. To access this, click the Menu button at the top left of your screen, and then click the Admin Central button in the drop-down menu. In your Admin & Settings screen, click the PayGo Quickstart button on the left side of your screen. This will take you through several steps where you can set up your store’s address and contact information, tax settings, sales methods, departments and users. Note: you can skip any of these steps if you’re unsure of the information. All of these settings can be accessed and modified through your central screens. It’s important to get your workstation set up to your specifications and preferences. Your workstation setup screen can be accessed by clicking your Menu button and selecting the Admin Central screen. At the top of your Admin & Settings screen, click the Workstation Setup button. In this screen, you can add, edit and change things such as your workstation type, printing defaults, invoice style and customer and inventory settings. For now, though, we’ll just concentrate on setting up your screen type and printer settings. To set your screen type, select from the Workstation Type drop-down menu in the Workstation tab. When you have chosen your preferred screen, click the Close button and your workstation change will be applied automatically. Feel free to experiment with which screen works best for your store, as this setting can be changed very easily. Retail – OneShot: This screen is an excellent multi-functional choice, which is why it’s our most popular. 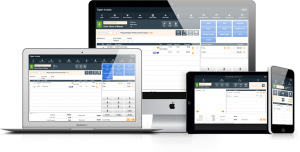 It allows you to create, search and select customer accounts for sales, create an invoice, and accept payments all in one screen. Retail – Basic: This screen is an expanded version of the OneShot screen. In this screen, there is a much larger area for invoice items, as well as an area to add notes and other details that OneShot doesn’t offer. The Payment details for this screen can be accessed by clicking the Pay Screen button at the top of the screen. Retail – Combo: This screen is a combination of the OneShot and Café screens. On the left, the display is set up for choosing menu items, and on the right, there is a setup similar to the OneShot screen, complete with payment buttons and an invoice area. Café: This screen is set up in a way to be most convenient for restaurants and cafés. It’s set up to easily select menu items from each department, as well as an area for any extras or subtractions a customer might want with their meal. The Pay screen can be accessed by clicking the Pay button at the top of the screen. Back Office: This screen is geared more towards online and mail order fulfillment. It’s heavier on detail and data entry boxes than the other screens, as it includes shipping and billing information, notes on the order, and information on your profit margin. Restaurant Touch: This screen is perfect for sit-down restaurants and cafés. It features a customizeable restaurant table layout so you can track which order goes where, and it also includes helpful tools for separating kitchen and bar orders and splitting checks, all alongside the PayGo functionality you know and love! You’ll also want to set up your printers. Your PayGo software works with PrintNode*, the remote and cloud-based web printing software that makes it easy to use and coordinate all your printing needs. And best of all, it’s free to use for PayGo customers! PrintNode will allow you to easily set printers for your all of your full page, label and receipt printing, even for online users. For more information on installing printers with PrintNode, see Setting Up PrintNode. At the top of the Settings tab, select Printing by clicking the circle next to it. In this screen, there are several fields to fill in that are relevant to your PrintNode setup. param_printnode_platform: [Important for WebDirect users] Please set this to the platform you use. param_printnode_printer_id_fullpage: Enter the PrintNode ID number for the printer you would like to use for full-page printing. param_printnode_printer_id_label: Enter the PrintNode ID number for the printer you would like to use for label printing. param_printnode_printer_id_receipt: Enter the PrintNode ID number for the printer you would like to use for printing receipts. param_printnode_username: enter your PrintNode username. This will be a long key provided in the email from support. When all relevant information is entered, you can either close out of the screen by clicking the Done button, or test your printers by clicking the PrintNode Test button. To use PayGo, you and your employees must have an individual employee record along with a user account and password. Without a unique user account, your employees will not be able to log into PayGo. Your employee screen can be accessed in Admin Central by clicking the Employees button at the top of the screen. To add a new employee, click the New Employee button and add all relevant information. If you don’t know all of the information, you can always come back to the screen and edit it later. You can set the employee’s login name and access levels at the bottom of the screen, and you can edit the employee’s security settings, such as their access allowances and security groups under the Security Levels tab. For more on creating and editing security levels, see Changing Company Security and Access Settings. For more on adding employees to your software, see Adding New Employees to PayGo. Keeping your vendors and consignors organized makes for an efficient ordering process, and PayGo’s vendor and consignor entry allows you to be as detailed and organized as you’d like. You can add new vendors and consignors in your Vendors screen, where you’ll find buttons along the top of the screen for adding both new vendors and consignors. You can also quickly add vendors or consignors without opening your Vendors screen by clicking the Plus button to the right of the Vendors button. This will take you to the Vendor/Consignor/Manufacturer Entry screen, where you can add all vital information about your vendors and consignors. You will also be able to see the products you purchase from these vendors under the Products tab as you add them to your software, and selling information about the items within the Sales tab. If your vendor is also a customer, you can link their vendor account to their customer account under the Linked Customer tab. For more on vendors, see Adding New Vendors to PayGo. For more on consignors, see Adding New Consignors to PayGo. It’s always a good idea to keep all of your inventory information detailed, thorough and accessible. Your new PayGo software makes it easy to keep your inventory organized with departments that can be customized, categorized and as detailed as you need. Defining Departments: Setting up departments will make it easy to organize items within your store, and PayGo lets you break down your items into departments, classes and categories, depending on how organized you’d like your inventory to be. To set up different departments, click the Menu button at the top of your screen, and select Products. On your Products screen, click the Departments button at the top right side of the screen. You can click the New Department button in the sub-menu to bring you to the Department Setup screen. This is where you can set up your department’s name, default printer labels, and so on. Within this screen, you can also set up your classes and categories within each department. For more on departments, see Adding Departments to PayGo. Now that you’ve set up some basics for your PayGo software, it’s time to start adding items! To add new inventory, access the Products screen through your Menu button. On your Products screen, click the New Product button. This will bring you to the Inventory Quick Add Screen, where you can add all of your item’s basic information, including onhand quantity and price, ordering costs and information, and department classifications. If you haven’t added the vendor or department information for your item yet, that’s okay; you can just add the names of the department or vendor now and the information will be saved. When you’ve added all the information you’d like to have, you can click Save & Close and the item will appear in your inventory (you can also view all of your inventory by clicking List All underneath the New Inventory button on your Menu Screen). To see more on adding products with the Quick Add screen, see Adding Inventory to PayGo with the Inventory Quick Add Screen. For more on PayGo’s full product screen, see Product Screen – Basics. Do you want to get started selling right away? See Can I Use PayGo Before I’ve Added All of My Inventory? Using your PayGo software to record your purchase orders as well as your inventory will make checking in your items simple. Your recently-created items, vendors and department information are all integrated on your software, making ordering more intuitive and creating less hassle for you. If you are ordering new items while setting up your software, it’s a good idea to start adding your purchase orders as well. PayGo has created a central Purchase Order screen which can be accessed through your Menu button so you can monitor all of your purchase order information at a glance. Creating a Purchase Order: To create a new purchase order, click the New Purchase Order button on your Purchase Orders screen. This will take you to the Order Creation – Purchase Order screen. In the Vendor Information box, you will see two tabs: Name and Summary. In the Name tab, enter the vendor name and information. If you are ordering through a vendor that you have already added to your PayGo software, that vendor’s information will auto-populate when you choose their name in the drop-down menu that appears when you click in the Vendor Name field. If you are ordering from a new vendor and need to enter their information into your software, click the New Vendor button at the top of the screen. This will take you to the Vendor/Consignor/Manufacturer Entry screen. In the Summary tab, you can view or add the Account Number, Payment Terms, and On Order Balance associated with the vendor selected. Both the Account Number and Payment Terms fields are populated by the information provided in the Vendor/Consignor/Manufacturer Entry screen. To view the On Order Balance for the specified vendor, click on the word Set next to the field. In the Order Information box, you are able to enter shipping and payment information for this purchase order under three tabs: Order Info, Ship To, and Bill To. The Order Info tab is where you can enter details about when the order has been placed, when it should arrive, which store the order is for, and information on any possible order cancellation. In the Ship To tab, you are able to set where the purchase order is being sent. And in the Bill To tab, you can set who will be paying for the purchase order. The Totals box is where you will set all cost information, from discounts to shipping and handling costs to any possible insurance paid on the shipment. Now that you’ve set up your purchase order, it’s time to add items to it. If you have already added the item to your PayGo software, you can search for the item quickly through your Menu button by clicking the Magnifying Glass to the right of your Products button, which will take you to a search screen. From there, your search parameters will open the Inventory Items screen where all items meeting your search terms will be listed. You can sort the item list by clicking the Sort button, which will take you to a pop-up screen where you can choose how you would like to sort. To add all items in the list to your purchase order, click the Set All to PO button. To add one item on the list to your purchase order, click the plus sign to the left of each item. To add a certain amount of each item, type in the number you would like to add in the Set Qty field, and then click the Add button at the top right of the screen. To add an item to the purchase order that you have not entered into your software, click the New Inventory button at the top of the Purchase Order Screen. This will take you to the Inventory Quick Add screen. Receiving a Purchase Order: You may also want to receive a purchase order as you are adding new items to your software. In order to do this, the purchase order must already be added to your PayGo software. To find the existing purchase order, you can either search for it by clicking the Magnifying Glass next to the Purchase Orders button on your Menu, or you can also click the List Open POs button within your Purchase Orders screen, which will take you to the Purchase Orders Found screen. On this screen, you can choose the purchase order you would like to receive items for by clicking the magnifying glass button next to each order. On the Receiving & Close Out Order screen, you will see the Vendor Information, Order Information and Totals boxes that were filled out when the purchase order was created. At the lower half of the screen, there are boxes for Receiving Information and Vendor Invoice Info. In the Receiving Information box, there are a few different ways you can choose to receive your items. To receive items by scanning them in with a barcode reader, click the Receive w/Scanner button. This will open up the Check In List screen, and a pop-up box will appear with fields for the items’ SKU and quantity of items received. To receive items without scanning them in, click the Receive Items button. This will open up the Check In List screen, where you can enter the items manually by filling in the Recvd field, as well as any other appropriate fields for each line item. To receive all items at once, you can click the Receive All button on the Receiving & Close Out Order screen. This will open a pop-up box stating that all items on the purchase orders will be received, and you can choose either Yes or No to complete this action. Note: lines that have been partially received will not be modified. You can print out labels for the items you have received by clicking the Print Label on Scan box at the top of the Check In List screen. In the Vendor Invoice Info box, you can enter the purchase order Invoice #, Amount to pay for the order, and Date to Apply. If you have added in the Shipping/Freight, Insurance, and Handling fields in the Totals box above, you can click the Allocate Shipping button to factor shipping costs into each item received. When all items have been received, click the Post PO button at the top of the screen. This will close out your Purchase Order. For more information on purchase orders, see Purchase Order Screen – Basics. To create a new till, select the central Sales screen in your Menu. On the right side of your screen, click the Plus button above your Active Tills box. This will open your Tills screen. Clicking Create in the pop-up box will prompt you to create a new Till ID. Click Create when your till has been named. Note: You cannot reuse a previously utilized till name. PayGo recommends you use a name and the current date for your till IDs. When your till has been created, you will be taken to the Tills Screen. This screen is organized by the till’s Create Date, Till ID, all Currency or Payment Method(s) that you accept in your store, PayGo Till Totals, Your Counted Till Totals, the currency/payment method Starting Amount and the Difference between the two figures. Your default starting till balance will show up in the Starting Amount column, under the Cash payment method. Typically, you will not enter starting amounts for all other till payment methods so those will be left blank. When you’re done entering all starting amounts, click the Close button at the top of the screen to finish creating the till. At the end of your day, you can close your till on the Till Closing Screen by selecting your active till in the tills box and then clicking the Post Till button at the top of the Tills Screen. Follow the prompts to post your till. For more information on tills, see PayGo Tills. Now it’s time to get to the good part: it’s time to make your first sale on your PayGo software! To start a sale, you must be in the central Sales screen, which can be accessed through your Menu. click the New Sale button at the top of the Sales screen. This will open a new Open Sale (invoice) screen. To add an item to your sales invoice, click the Search Products field and either Scan a barcode (if your workstation is equipped with scanners) and press ENTER on your computer’s number pad to find the inventory item, or search for the inventory item using its name, item ID number or any other descriptors you have entered in the item’s inventory page. Click anywhere outside the search field or press ENTER to perform a search. This will take you to the Inventory List screen, where you can choose which item you would like to add to the invoice by clicking the Plus icon to the left of the item’s line. When all items have been entered, click the appropriate payment type from the Payment Method buttons on your screen. The selected payment method will show up in the Payment Method column under the buttons, with a field under the Amount column for you to enter the amount the customer has given you. Totals for the invoice, including any cash back, will be shown in the fields at the bottom of the screen. To post the sale, click either Post & Print to print out a receipt for the customer, or Post No Print to complete the sale without printing a receipt. When the sale has been posted, you will see a pop-up box asking you if you would like to View the transaction, Open Inv (which will open the Invoice List screen) or start a New Invoice. For more information on the sales screen, see Making a Sale. You can easily organize and keep tabs on all of your loyal customers through the central Customers screen, accessed through your Menu. Keeping customer records can be useful for a variety of reasons: you can track customer invoices and orders, keep handy notes about your customer (such as the kind of wine they like, or other useful information) so your employees can create a rapport with your patrons and suggest items they might like, or you can create a customer loyalty program that will keep them coming back for more! You can also integrate your customer records with PayGo MailChimp to create automatic marketing campaigns. -If you are currently in a sale and wish to add the current customer, click the New button next to the Search Customers field on your Open Sale screen. After you add them to your software, they will automatically be added to the invoice. -You can click the Plus button next to the Customers selection within your Menu. -In your central Customers screen, you can click the New Customer button at the top of the screen. All of these selections will bring you to the Customer screen. In this screen, you can enter all kinds of relevant information about your customer. The Information and Contacts tabs is where you can add the customer’s basic contact information and the Ship To/Bill To tab is for the customer’s ordering and shipping addresses. The Marketing tab is where you can store information for your customer that is relevant to your store. For instance, if you’re a pet store, you could keep information on your customer’s pets, such as the pet’s breed, name, favorite foods and toys. You can also keep similar information (or any other info you’d like to record) in the Global Notes tab. If you have a frequent buyer program, you can record the customer’s points totals in the Freq (frequent) Buyer tab. For more information on how to integrate frequent buyer programs into your PayGo software, see Frequent Buyer Programs. Similarly, if your customer is part of a membership discount program, you can add that in the Discount tab. For more on the membership discount programs, see Membership Discounts. If you use PayGo MC, you can set which marketing campaign to use for this customer in the MailChimp tab. Lastly, if your customer is also one of your consignors, you can add that information in the Linked Consignor tab. For more information on adding customers, see PayGo’s Customer Accounts. And you should be ready to go! Be sure to check out our Knowledgebase for information and tutorials. If you need any help with your new software, you can submit a support ticket, chat online on the PayGo website, or start a screensharing session with our tech support.